Finals are just around the corner and we want students to end just as strong as they started! This final webinar will focus on using analytics to identify struggling students and challenge top performers. We will look at digital tools to help your students prepare for their finals, and help you quickly and easily deliver final exams and grades. Let's end the term strong! You've started class and are in the swing of things now what? This webinar will provide tips and tricks on how to boost student engagement, increase productivity, and get students ready for success on midterm exams and projects. Keep your students moving in the right direction with Aplia tools and strategies. In the first webinar we'll help you hit the ground running! This webinar will focus on getting your course set up, student registration, and the basic features of Aplia that will get your students engaged and mastering course content from Day One! Start the term off right by attending this Getting Started Webinar! Finals are just around the corner and we want students to end just as strong as they started! This final webinar will focus on how to use analytics in Aplia to identify struggling students and challenge top performers, and provide specific strategies for handling both situations. We will also look at digital tools to help your students prepare for their finals, and help you quickly and easily deliver final exams and grades. Let's end the term strong! You've started class and are in the swing of things now what? This Moving into Midterms webinar will provide tips and tricks on how to boost student engagement, increase productivity, and get students ready for success on midterm exams and projects. Keep your students moving in the right direction with new Aplia tools and strategies in this Moving into Midterms webinar. Get up and running with Aplia quickly! In this hour long session, you'll learn how to log into the system, create your own course, learn to set up assignments, and more. Are you afraid of running Aplia Experiments for Economics? What can you do if things go awry during an Experiment? How do you run an Aplia experiment? If you're either new to Aplia Experiments or have used them before, this session can help. Led by experienced faculty, this session will help you to know how to setup and run an Aplia Experiment, and what to do if something goes wrong during an Experiment. Registration will cut off three days prior to session start. Pre-session work will be required, and it will be necessary to register as a student for the demo course. Information for registering for the demo course and for the pre-session homework will be sent to you via email shortly after registration cutoff. Do you wish you had more data about individualized student performance to help students improve their learner behavior? Explore Aplia's gradebook analytics to learn how to identify students who may be falling behind and those who are doing exceedingly well. This session will address how to identify indicators that affect students who are successful and those who struggle. Strategies for responding to both situations will be recommended. How much time outside of class do your students spend engaged in critical thinking about course content? This session will focus on how Aplia can provide an opportunity to maximize students' engagement and ensure you'll have a successful start using Aplia. You'll learn the basics of how to create a course, navigate Aplia, add and edit assignments, and use the gradebook. Don't just settle for the status quo! Do you have favorite assignments that have been proven to help increase students' understanding of your course content? Make your Aplia course fit seamlessly with your instructional approach, strategies, and activities. Capitalize on Aplia's flexibility with course design by learning how to customize the existing materials, add your own favorite assignments and readings, and create assessments from your material or from the test bank. Build a course that reflects your pedagogy. Explore Aplia's gradebook analytics to learn how to identify students who may be falling behind and those who are doing exceedingly well. This session will address how to identify indicators that affect students who are successful and those who struggle. Strategies for responding to both situations will be recommended. Build a course that reflects your pedagogy. 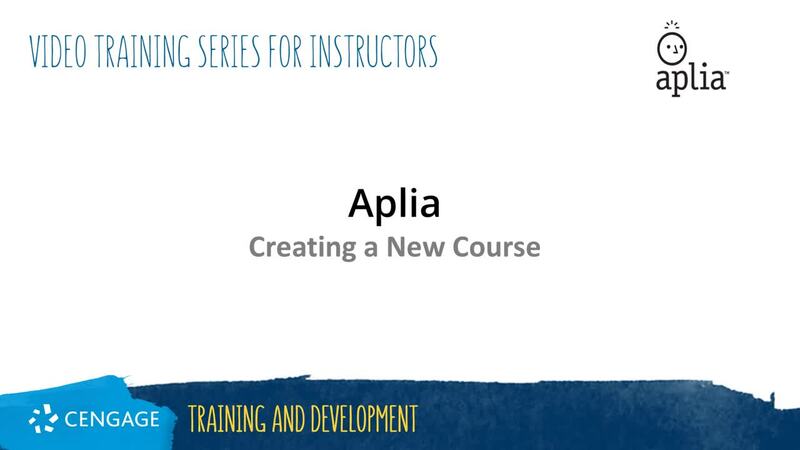 Make your Aplia course fit seamlessly with your instructional approach, strategies, and activities. Capitalize on Aplia's flexibility with course design by learning how to customize the existing materials, add your own favorite assignments and readings, and create assessments from your own material or a test bank. In this session, you will learn tips and strategies to help you engage your Introductory Statistics students, making it easier for them to appreciate the importance of statistical literacy in the real world. Learn how you can utilize Aplia for Statistics to develop your students' technical skills, conceptual understanding, and ability to interpret data and draw conclusions.